William Langland’s poem stands at the centre of the study of ideological conflict, social change and religious ideas in the later fourteenth century. It is a poem that vividly encapsulates the great issues and debates of the day and acts as a commentary on cataclysmic events such as the Peasants’ Revolt (1381), the condemnation of Wyclif’s ideas (1382) and the rise of Lollardy. It is also one of the greatest poems of the English Middle Ages, worth reading beside Dante and Chaucer. The poem has provoked a sophisticated and wide-ranging critical literature. It needs to be read in an edition by an expert conceived with the student-reader in mind. Of the A, B and C versions of the text of Piers Plowman, only a student-geared edition of the B-text exists and that edition is now becoming dated. The C-text, which supersedes B in terms of Langland’s poetic career, is also a more complete and carefully structured poem. It needs to be available in an equally readerly edition; this is such an edition.For his new edition of the C-text of Piers Plowman, Derek Pearsall has completely revised the text, added side glosses for the benefit of student readers of the poem (though without sacrificing the glossary), and revised and updated the explanatory notes. The Introduction has also been expanded, revised and reshaped to take account of this. Since the new edition involves a significant reworking of the previous edition and justifies library copy replacement, a hardback library edition will be available for a limited period. Scholarly and accessible, this will be an invaluable edition for both students of the poem and those specializing in the field. Although a ‘student edition’ in that it provides help for beginners in the field, its scholarship, especially in its explanatory notes, cannot be ignored by the most seasoned scholars. Only those who have struggled in the same arena will recognize how many problems Pearsall has solved with easy grace and humility. The new text, handsomely and legibly printed, has a larger format than its predecessors, partly to accommodate marginal glosses, which Pearsall somewhat reluctantly supplies because ‘it has become a necessity in the light of the expectations of modern readers. The marginal glosses now make Pearsall’s edition a stronger competitor with Schmidt’s student edition of the B text. The annotation is the glory of Pearsall’s editions, both original and revised. We are grateful to Pearsall (as we are to Langland) that he continued to work on this poem across several decades. 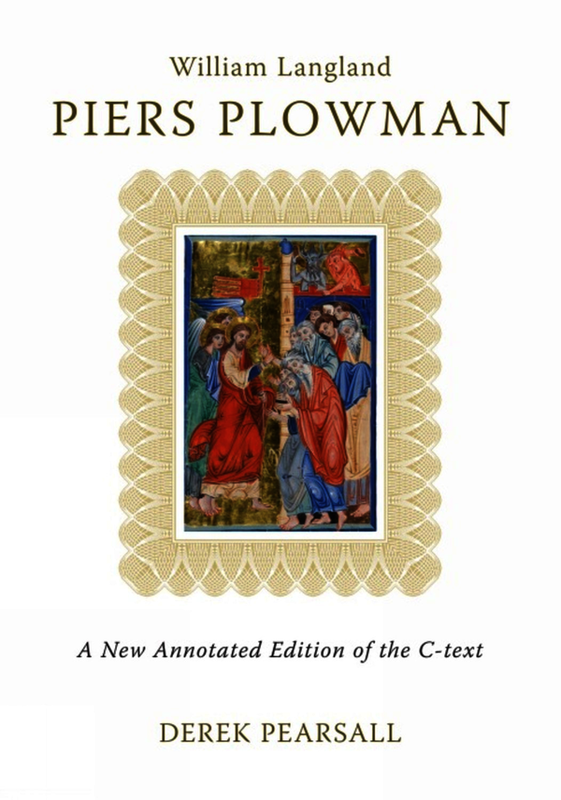 Like its predecessor thirty years ago, Derek Pearsall’s new edition of the C text Piers Plowman will be a welcome volume on the shelves of scholars, teachers, and students of the poem. As with the first edition, it is a pleasure to read a version of the poem in and for itself, with enough context provided to allow readers with a general competence in Middle English, but not deeply versed in Piers Plowman scholarship or the poem’s cultural milieu, to engage with the work. That engagement is aided by the side glosses (new in this edition); explanatory footnotes (significantly expanded from the first edition); and a revised introduction, with a very useful series of thematic notes on such overarching topics as the Dreamer, friars, Lady Meed, the seven deadly sins, and so on, expanded and transferred from their original positions in the old on-page notes. Given the reasonable price of the paperback edition, the text could well be used in advanced undergraduate as well as introductory graduate courses in Middle English Literature ... the book is generally pleasing to the eye; slightly larger-than-normal dimensions provide enough white space for easy reading, always a concern in books with apparatus in both the margins and the foot of the page ... The revised text, the enriched but still selective textual apparatus, and the extensively updated notes, introduction, and bibliography make Pearsall’s new, annotated Piers Plowman a valuable introduction to the C text as is has come to be understood over the last thirty years and an important complement to other editions of the poem. ... making this edition one of the most valuable tools available. Derek Pearsall is Professor Emeritus of Harvard University and a pre-eminent scholar of Langland and Chaucer; he has published widely on both authors.